A much-needed overview of the synthesis of chiral Brønsted acids and their applications in various organic transformations. The internationally recognized and highly respected expert authors summarize the most significant advances in this new and dynamically progressing field, with a special emphasis on BINOL-derived phosphoric acids. 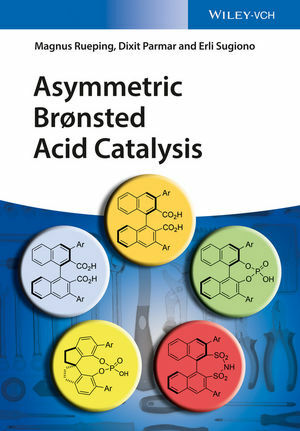 They also describe other catalysts, such as C-H, TADDOL-derived Brønsted, and sulfonic acids. For easy navigation, the chapters are organized in the first instance according to reactive intermediate and then sub-divided by reaction type. An appendix with selected experimental details for benign and straight-forward procedures rounds of the book, making this the number-one information source for organic chemists in academia and industry. Magnus Rueping is Professor of Organic Chemistry at RWTH Aachen University, Germany. He studied at the Technical University of Berlin, Trinity College Dublin, and ETH Zürich, where he completed his diploma thesis under the direction of Prof. D. Seebach. He stayed in the Seebach group and obtained his Ph.D. from the ETH in 2002. He then moved to Harvard University to work with Prof. D. Evans on enantioselective transition-metal catalysis. In August 2004, he was directly appointed to a C3-professorship, the Degussa Endowed Professorship of Synthetic Organic Chemistry at Goethe University Frankfurt. In 2008 he accepted a Chair and Full Professorship of Organic Chemistry at RWTH Aachen University. His group's current research interests include enantioselective organocatalysis, metal- and biocatalysis, new reaction methodology and technology, new materials as well as photochemistry and flow chemistry. Dixit Parmar is an Alexander von Humboldt fellow at RWTH Aachen University, Germany. He obtained his MChem degree in Chemistry with first class honours from the University of Manchester, UK, in 2008. He stayed there further to conduct his Ph.D. with Prof. D. Procter on the development of reductive lactone cyclization cascades mediated by SmI2-H2O. In 2012, he moved to RWTH Aachen University as a postdoctoral researcher in the group of Prof. M. Rueping. His research interests include organocatalysis and asymmetric fluoro-cyclizations. He has received the prestigious Reaxys PhD Prize in 2011. Erli Sugiono is a senior scientist at RWTH Aachen University, Germany. She graduated from the Johannes Gutenberg University of Mainz, Germany, and obtained her Ph.D. in the research group of Prof. H. Meier. She then joined the Max-Planck-Institute of Polymer Research (Mainz) as a postdoctoral fellow in the group of Prof. Dr. H.W. Spiess. She joined the group of Prof. M. Rueping in 2005 and was appointed to the position of senior scientist in 2009. Her work centers on the development of new methodologies for asymmetric catalytic transformations, catalytic flow reactions and the synthesis of biologically active compounds.